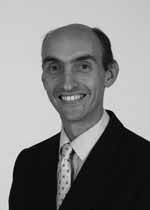 Mr Bennett is a General Surgeon with a specialist interest in upper gastroenterology. He looks after patients with upper gastrointestinal cancer (stomach, oesophagus, pancreas, gall bladder and small bowel) and with benign upper gastrointestinal conditions such as gall stones, common bile duct stones, gastro-oesophaeal reflux disease (GORD), peptic ulcers and oesophageal Barrett's. He performs laparoscopic cholecystectomy, laparoscopic bile explorations and laparoscopic hiatus hernia repair/ anti - reflux proudures. He also has a specialist interest in hernia surgery and performs open and laparoscopic (key hole) repairs of all types of hernias, both primary and recurrent. Mr Bennett is Chairman of the Day Surgery Unit at the Royal Bournemouth General Hospital and is interested in expanding the number of procedures performed as day cases. Mr Bennett sits on the British Herina Society and was responsible for organising the 5th Annual Conference of the Herina Society in Bournemouth. Mr David Bennett does not hold a share or financial interest in this hospital, another Nuffield Health hospital or the company. Mr David Bennett does not have a share or financial interest in equipment used at this hospital or another Nuffield Health hospital. Mr Bennett is a member of the Nuffield Health Expert Advisory Group who provide project specific advisory services on an as required basis. EAG members are paid a day rate of £1,000 or an hourly rate of £150 plus reasonable expenses incurred. No fees have been paid to Mr Bennett during 2016 to date.